Dynamic intraligamentary stabilization (DIS) stabilizes the knee joint during anterior cruciate ligament (ACL) healing. After 6 months, tibial hardware removal is offered to the patients if local discomfort at the implant site is present. This study compared knee laxity and functional scores 2 years after DIS between patients with and without hardware removal. It is hypothesized that it does not affect ACL healing. The study retrospectively analyzed prospectively collected data from 173 patients with either hardware removal (n = 47) or no additional intervention (n = 126). Inverse probability of treatment weighting using the propensity score was applied to balance the groups for baseline characteristics. The primary outcome was the side-to-side difference in knee laxity measured with the rolimeter at manual maximum force (Δ-Lachman). Secondary outcomes were the pivot-shift test and subjective scores. Mean age was 34 years in both groups, and female gender was 47% (hardware removal group) and 50% (control group), respectively. No significant differences were found for Δ-Lachman (p = 0.09), pivot-shift test (p = 0.41), and subjective scores (p > 0.10) two years after DIS. Knee laxity 2 years after DIS in patients with tibial hardware removal and patients without hardware removal was not significantly different. The groups were also similar regarding all the assessed functional scores. 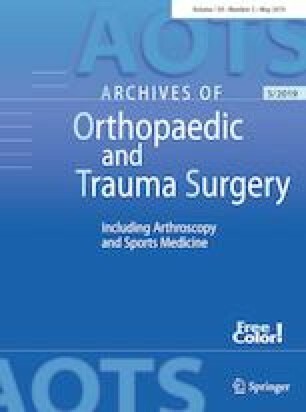 This study confirms the hypothesis that the healing ACL resumes its stabilizing role, and the hardware can be removed beginning 6 months after surgery without adverse consequences for joint stability. Janosch Häberli and Kathrin Susan Bieri have equally contributed to this study. The authors would like to thank Edith Hofer for her great work in coordinating, supervising, and completing the collection of the comprehensive data set for each patient. They would also like to thank Christopher Ritter for editorial assistance. All authors have received reimbursements or funding from Mathys AG Bettlach, Switzerland, in the past 5 years. The authors are not compensated for this work.